Browsing through scrumptioius recipes probably isnt the best thing to be doing while on a detox. But this recipe looks SO good. Position rack in the lower center of the oven. Preheat to 350F. In the work bowl of a food processor, pulse the cream filled cookies (cream filling and all) and process until finely ground. Add the melted butter and process until the mixture starts to stick together. Press the crumb mixture in the bottom of a greased 10-inch springform pan. Bake for about 12 minutes and then set aside while you make the filling. In the bowl of a stand mixer, using the paddle attachment on low speed, combine the cream cheese and peanut butter until smooth; add sugar and continue to beat until smooth. Now add the eggs, one at a time, followed by the vanilla: again, beating until smooth. Be careful to incorporate as little air as possible. Pour enough batter into the springform pan to cover the bottom crust. Add all but the 16 reserved mini peanut butter cups and top with remaining batter. Wrap the sides of the springform pan with insulated cake strips and place on a sheet pan (damp kitchen towels work too). Bake for 1 hour and 25 minutes. Whisk together the sour cream, sugar, and vanilla until the sugar dissolves; set aside at room temperature until cheesecake is done. After 1 hour and 25 minutes, remove the cheesecake from the oven, but don't turn it off yet. Pour sour cream topping onto hot cheesecake and smooth the surface; return to hot oven for 5 minutes. Remove from oven and cool for 1 hour before placing in the fridge to chill for at least 4 hours (overnight is preferable). Just before service, garnish by piping a decorative border of sweetened whipped cream around the perimeter of the chilled cheesecake and evenly distribute the Reese's peanut butter cup minis. 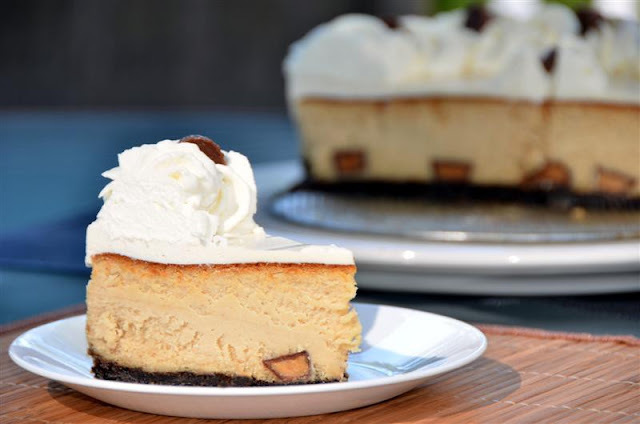 -Be sure the ingredients for the cheesecake batter are at room temperature before mixing; mix on low speed to minimize air incorporation (which would cause the cheesecake to puff up and deflate during baking resulting in a cracked top). -Cheesecakes continue to cook after baking, so don't be alarmed when you see the center jiggle (you don't have to know this, but internal temp should reach about 150F). 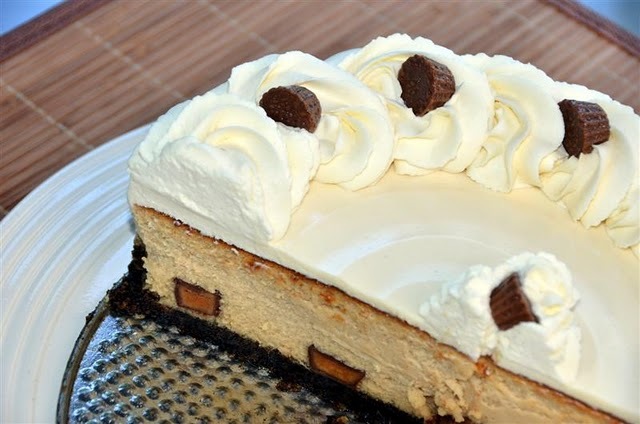 -Cheesecakes will absorb lingering odors from the fridge, so store in an airtight container. -Cheesecakes aren't firm enough to cut until they are completely chilled. -For professional looking slices, rinse knife with hot water and dry between each cut. Hi Natalie! Wow, I'm so honored that you posted my recipe on your blog. Thanks for the mention! I'm off to have a look around your wonderful blog - hope you have a great week!